Claim Your FREE Book & Bonus NOW! For a Limited Time… You Can Copy My Proven System, Escape The “Rat Race” Be Your Own Boss… and Gain Financial Freedom! Real estate is the best way for the average person to gain financial freedom. I know from personal experience. 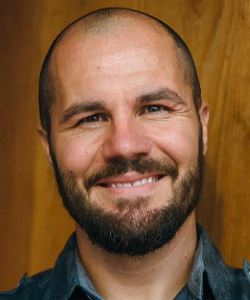 In my mid-20s, I was a construction worker barely scraping by. Then I found real estate, and (after years of hard work) I “cracked the code” and developed a repeatable system for flipping houses. You can skip all that work and “copy” my proven system for making money with real estate in your spare time. All you need is a desire for change. Whether you’re a recent college grad trying to get out of debt… a Baby Boomer approaching retirement without a nest egg… or you just want to replace your J-O-B and enjoy life… then real estate (and this book) are for you! Don't be mislead by the title - this is not just another "how to make a million dollars..." book. In an industry rank with gimmicks and idealism, this book sticks to simple and effective principals of hard work, persistence, and patience. Refreshing! This is a real estate investment book I would put at the top of your Amazon wishlist. This is the most detailed step-by-step procedure that I have come across that REALLY WORKS! Period! Jerry Norton's book... is great. The book is detailed and informative and gives invaluable information to anyone interested in investing in and flipping houses. It covers just about everything involved in the process and answers most of the questions you might have. This is an excellent book with lots of great tips and good specific information - much of which I have not seen in other books about flipping. This is a good resource for both novices and more seasoned flippers. This is a great read! Very informative, well thought out information. Everything you needed to know about flipping houses! Jerry I just got your book going through it has a lot of good contents, the information is spot and it shows your experience as a real estate investor. The book is good, it gives a great foundation for either the beginner or a seasoned investor. Jerry's book is very conclusive. You acquire a well-rounded understanding of what is involved in Flipping properties. It is very enlightning in discussing the depth and breadth involved in the Flipping process. This book will be the model of all future publocations with similar subjects. Jerry has the experience and expertise to complete this very valuable resource and he has done it in world class authority. I really appreciate Jerry Norton. His information is always helpful. Following his advice gives you confidence and leads to success as an investor. His suggestons are thoughtful and based on his experience which means they really have been tried and tested. Mr. Norton is very informative. He presents the information in a clear, precise, and efficient manner. The information is a good refernce for everyone, especially beginners. Very easy to read. What I liked best was that he gave examples and explained some terms that a newbiew would not really know. I would definitely recommend. I am just starting my REI Business. If you allow yourself to get caught up, you will find yourself spending a lot of money when you don't have to with the teachings of Jerry Norton. Coupled with his lifetime examples, Jerry takes you on a trip with him as he shows you exactly how he does his deals. Very facinating read. Jerry is clear and concise and quite honestly, you need not go any further when trying to wholesale deals. Pay attention, because I’m about to bust a major myth. Because of house-flipping shows on TV, most people think you need to visit properties, manage rehabs, and constantly be on call. I do most of my deals remotely, without ever setting foot in the houses. That means I work when (and where) I want to, and most of my students do too. With my system, you can work from home on your own terms, and you do NOT need to have computer skills, personal connections, or any business experience. With real estate, you don’t need to be born into wealth or have Ivy League connections. Like me, you can start from nothing. Like I said before, I went from being a construction worker to making millions, and I’ve also helped my students flip over $100 million worth of real estate. It’s been a wild ride… and it’s all in the page of my book. So... if you want to be your own boss (and make more money than your last THREE bosses combined) then you need to claim your FREE copy of my book today. When you do, I’ll even throw in a Free Bonus Resource to jumpstart your success. When you claim you free book today, you’ll get instant access to an exclusive Free Bonus Resource… my “Copy & Paste” Craigslist Hacks. 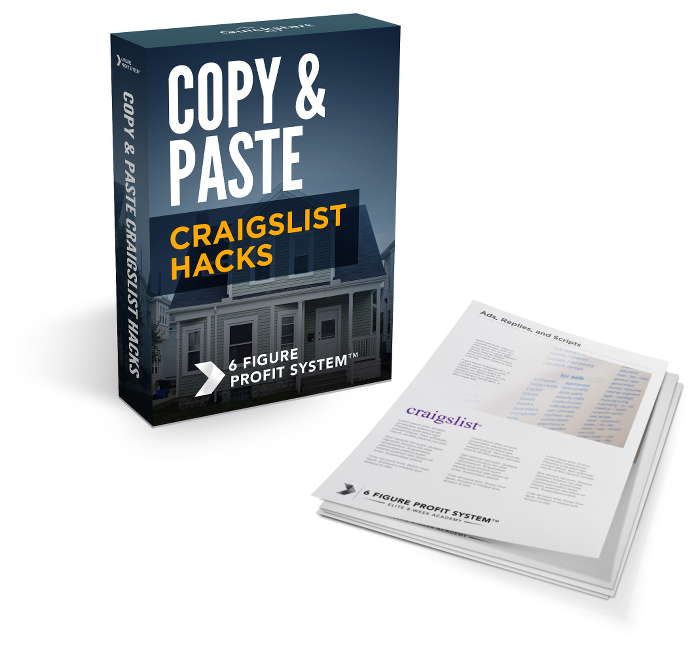 Craigslist is a fast, easy, and FREE way to find discounted properties, and with these “copy and paste” ads, replies, and scripts, you can quickly find hot deals to flip for profit. I’ve also included the Top 20 Keywords that motivated sellers use on Craigslist, so you can laser-target the best deals. You might be wondering why I’m giving you all this for free. If it’s good, then I should be charging for it, right? The thing is… I normally do charge for this. Other people have paid $97 for the book and Craigslist Hacks in the past, but I want to give them to you today for two reasons. One… I’ve been blessed in my life, and I want to give back. Two… I want to be America’s top real estate trainer, and the best way for me to do that is by getting feedback from my readers. When you go through my training, all I ask is that you send me your honest feedback. Or, if you love the book, and want to send a review, that’s great too. Right now, I’m still looking for feedback, but once we collect enough, I’ll be taking this page down or raising the price. 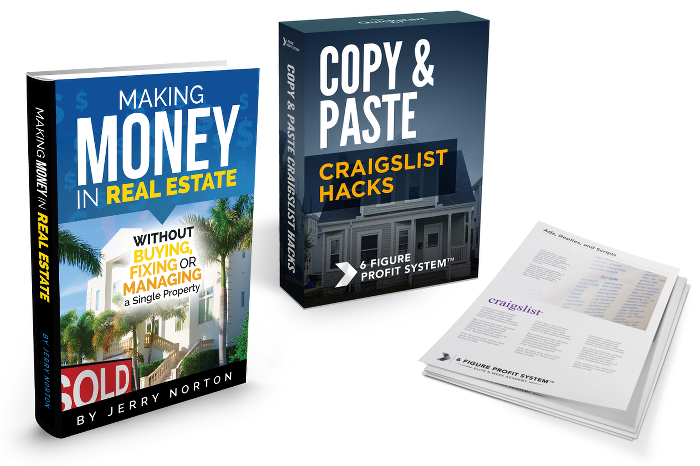 So, make sure to claim your FREE copy of my ebook (and your Free “Craigslist Hacks”) today. Claim Your Free Book (and Bonus Resource) Now! Click Here to Claim Your Free Book & Bonus!